The concept of inventory produces a mental representation of different things for different people. It can mean a company’s goods and materials for resale, and can include all work that has occurred. Every aspect of a business is considered to be part of the stock in one form or another, including the tools used to conduct day to day operations. This includes the items within your telecom environment such as, phones, data circuits, and all wireless devices. Telecom is the exchange of information over distances, by electronic means. 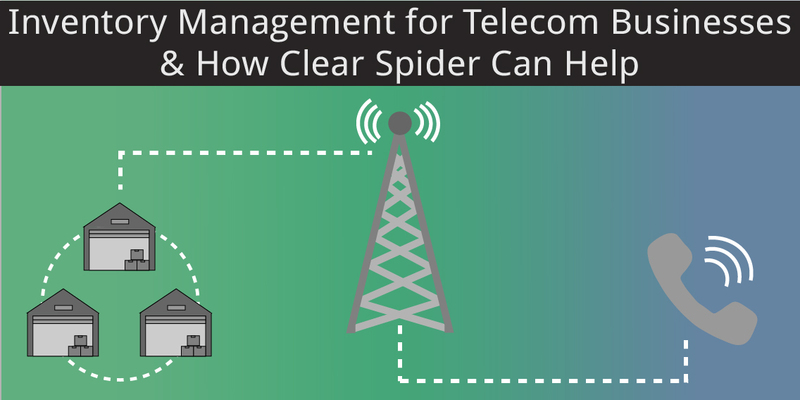 In this post, we will discuss inventory management for telecom businesses and how Clear Spider helps. Why is inventory management for telecom businesses important? There are many reasons why it is crucial to have good inventory management in your telecom business. Firstly, it is essential to have a true source of records. It helps to keep track of your inventory and to pinpoint any inventory shrinkage’s there may be. You want to know where your inventory is going, as well as who it is going to and where they’re installing it. Having a strong inventory management will make your warehouse operations less complex, but the real value is being able to find something quickly. This allows you to capture the intricacies, and complexities, surrounding your inventory, as it moves through the supply chain. The benefits are endless when you have a strong inventory management system in place. Your assets are vital to the success of your company. Technology is costly. With changing technology, upgrades, and new security features, you want to ensure that you have an eye on your inventory to keep your business profitable. Unused inventory leads to extra expenses. A good inventory system will be able to tell what is and isn’t being used, in all of your locations. This ensures that you have what you need, where you need it, at the right time. What problems arise if I don’t have inventory management? Without the adequate software support, managing sourcing, procurement, invoices, and inventory, are labor intensive and prone to errors. Go mobile! Clear Spider’s mobile solution allows for real-time inventory management. Using an iPhone or Android, smartphone scanning allows users to work offline, quickly scan and record transactions, as well as increase inventory visibility. Therefore, employees can revise inventory levels wherever they are, helping to increase overall accuracy and reliability. With the mobile app, there is also end-to-end tracking of available stock and assets, which can be used by field technicians, during daily interactions with customers. This gives technicians the ability to have scan in/scan out capabilities. In addition, you have real-time visibility of inventory at forward stocking locations, including distribution centers, warehouses, trucks, etc. Moreover, you have the ability to integrate with a previous system you may have. This gives you the ability to streamline inventory processes with a more flexible and scalable solution. Clear Spider has many benefits, but there are 4 that specifically address the needs of telecommunication businesses. The Clear Spider system allows you to set custom roles and permissions for each of your users, based on organizational structure and needs. This function allows employees to only see and do what is needed. With Clear Spider, you have full visibility and can keep track of every transaction. Delivering full transparency on information provides you with easy access to all of the information stored. Scanning capabilities are crucial when trying to keep track of your inventory, and know what your employees need. With Clear Spider you can fill and create orders, check and lookup items, and adjust and transfer items. With Clear Spider’s system you can access information it captures, anytime you need it. The extensive reports produced does comparisons, creates graphs and charts, and generates detailed analysis. It is very important to keep control of all of your inventory. Balancing your competing business needs optimal inventory levels, and a smooth supply chain. Want to learn how to manage your inventory? Find out how Clear Spider can help you.